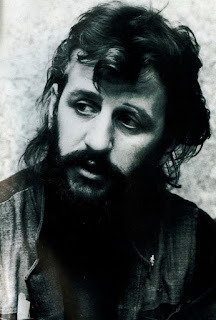 This is an interview Ringo did on April 17, 1975 with Ron Chapman in Dallas, Texas. I found it in the "The New Beatles Fan Club" fanzine from 1975. Ron: Let's talk about your drumming. Do you ever practice? Ringo: I've never practiced in my life; only with a band. I've never been one who can sit in a room and go rump-a-bum you know, one of those. Ron: But it's true to say that after the split your technique of drumming has increased. Ringo: I've always been a good drummer. I've always been put down as a drummer but I haven't fought it. It's not in my nature to come out saying, "What are they saying I can't play!" I feel I'm the greatest drummer in my style. Ron: What other drummers do you like now? Ringo: Of course, Keith Moon; Jim Gordon's great and, ah, on the Ry Cooder album--I can't remember his name. Ron: Would it be true to say that you invented the "pudding" sound? Ringo: I really think so, because I loosen the skins so much and then I wrap some tea towels round them, and it makes it like thuddy, you know? Ron: When did you start it? Ringo: Oh, I guess it starts coming through on Revolver. Yeah, it came though then. Ron: Mal and Paul thought up Magical Mystery Tour, right? Ron: What's your very favorite Beatles album? Ringo: Well, Abbey Road is awful good but really my VERY favorite is the White Album. Ron; Back in the Beatle days you were labeled cute and maybe even the dumb one. Ron: Well, how did you react to this? Ron: Have you seen, "Tommy?" Ringo: Oh yeah, of course. I'm a movie-goer, or haven't you heard? Ron: What did you think? Ringo: Oh, "That'll be the day" is great! Ringo: Well, I really liked it! It's going to be a great smash! Kind of a lame interview, but it's not Ringo's fault. Ron Chapman just didn't think through his questions very well. Still, Ron's a Dallas radio legend, having started at KLIF -- THE Dallas teen station in the '60s -- back in 1959. As "Irving Harrigan" of the "Charlie and Harrigan" morning team, Chapman introduced the Beatles at their Dallas concert on September 18, 1964. Starting in 1965, he hosted a couple of terrific teen shows on Dallas television -- first called "The Group and Harrigan", then "The Group and Chapman". From 1966 until 1968, he hosted an afternoon teen dance show (similar to "American Bandstand")called "Sumpin' Else" on which every visiting pop group appeared, from Sonny & Cher to Paul Revere and the Raiders to, yes, the Mothers of Invention! He later continued his radio career with KVIL and KLUV in Dallas and is now, at age 80, rich and retired. He had a stroke a few years ago, but is now doing better. I met him in December 2014 at the Dallas launch of a book about the "Sumpin' Else" show. He used to have quite an ego, but has mellowed in recent years.